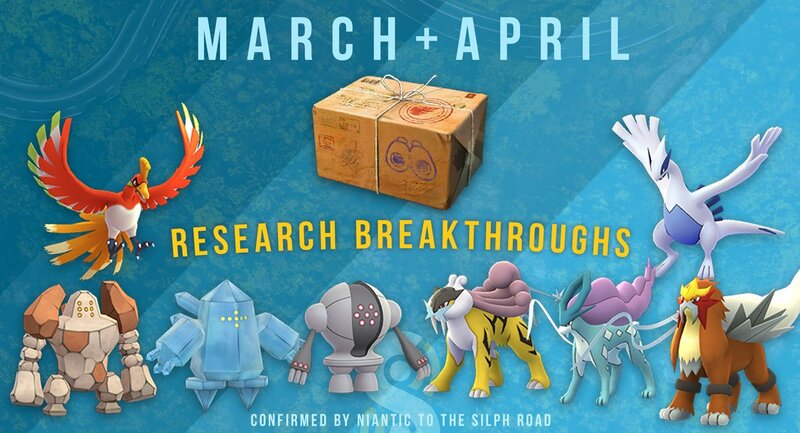 March 1st at 1pm PST, these 8 legendaries will all be in the breakthrough pool: Raikou, Entei, Suicune, Lugia, Ho-oh, Regice, Registeel, and Regirock! If you ask me, the beast should have gone, the birds should have stayed. Got a 100% Raikou, wouldn’t call that bad, but they are here to long. Hope they swap the birds in April. but they are here to long. That’s why I’ve called them horrible. Jesus, not even interested on keeping tasks streaks since last month. Tired of Enteis, but I did catch a 100% Suicine. The most useless of them all. Ugh. I need the Regis and won’t mind a few more Ho-oh and Lugia (got the shiny of both though), but I have SO MANY of the beasts! Wish it was only Lugia and Ho-oh. Entei, Raikou, and Suicune have been research breakthroughs too long already, and I was happy to see the Regis go away when each finished its stint as raid boss. Those are fun for the PvP Great League. The only one that interests me is Raikou as I would love another 96% 15attack or above. All I seem to get is useless Suicune though. For my husband’s sake, I hope that he gets Regice and Regirock. Only Legendaries he’s missing minus Dialga. I actually use the Regis as anchors for my teams as they start to faint out, since they’re TDO is amazing. They’re always at the very end of my teams in Raids. This could fill dex of non-raiders like me, so this is a welcome proposition. Just hope will get them all and not a bunch of same pokemons. I know many like this random stuff… But I’m tired of not knowing what I’ll get. I preferred the full months of a certain Pokémon. Not necessarily a legendary… Snorlax was OK… Shedinja was nice to collect candy for one day when I MAYBE get a Nincada… (does this really need to be that rare?!?). I’d have been OK with a month of Ho-Oh and Lugia randomly (still hunting the shiny Ho-Oh) and then let’s say two months with the Regis randomly, so there’s 8 (or more?) chances to get one of each. But another two months with the beasts is just way too much.